The first pleasant surprise from acoustic guitar virtuoso James Blackshaw’s latest release is that its opening track presents not even a whiff of that venerable 12-string upon which Blackshaw has built his reputation. The second: despite being comprised solely of repeating piano notes, the composition immediately strikes as his own, pimping the same elongated format and alternating melodic figures the artist usually employs with the guitar. I’ve always had trouble thinking of Blackshaw as an author in minimalism—the way even his solo guitar pieces breathe and expand upon themselves seems a bit grand for the tag—but with “Gate of Ivory” I’d be hard-pressed categorizing the music as anything else, despite the fact that almost nothing has changed in his technique. There’s something about the piano’s sound, though augmented by the sustain pedal, that communicates a great deal of restraint and understatement Blackshaw’s sprawling guitar pieces tend to eschew. The results on Litany of Echoes are most spellbinding when Blackshaw pairs this piano minimalism with his expansive guitar playing, and “Past Has Not Passed” represents the most successful example of this synergy. Like many of Blackshaw’s past works, the piece kicks off with sluggish, heavy down-strokes, but this time an eerie background of strings projects an unsettling vibe where previous arrangements might have leaned towards the euphoric. Here we see the fruits of Blackshaw’s collaboration with violinist/violist Fran Bury: the same bending—practically melting—string ambience from which Jonny Greenwood draws heavily in his score for There Will Be Blood. Once the track’s initial, sinuous creep comes to an end, Blackshaw begins playing his guitar with clearer deftness, layering each circling motif to create a communal illusion. This would be par for the course for Blackshaw, except the additional instrumentation adds a whole new dimension: the strings sway along to Blackshaw’s chord changes while the spare piano notes create ripples in the flowing composition. The piece perfectly encapsulates the growth the artist has undergone since recording his last record and it easily ranks among his best work. 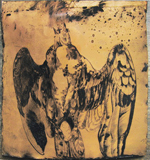 Unfortunately, a couple of minor flaws prevent Litany of Echoes from matching last year’s effervescent The Cloud of Unknowing. “Infinite Circle” sounds a bit too benign sitting next to the darker, more dissonance-obsessed pieces that fill Litany. Perhaps it’s meant to serve as a sort of cheery repose in the middle of this shadowy abyss of a record—how the screeching dissonance of “Clouds Collapse” provided a break in Cloud‘s atmospheric highs—but it mostly sits out of place, its piano melody a little too eager to please. Another source of frustration, in the light of last year’s more ostensibly expressive release, is how Blackshaw’s comparatively restrained aesthetic produces fewer moments of catharsis, moments that leave the listener truly agog, relying, instead, on seething, subcutaneous change and cerebral dynamics. Still, there’s no reason to pick out all of Blackshaw’s growing pains when he’s undoubtedly growing into something greater. He has incorporated other instruments into his formula before, but where those adornments often sounded tacked-on (see: the sitar on O True Believers ) here they’re fully integrated into his palette, intuitively complementing his cascading guitar chords. Closer “Gate of Horn” further demonstrates his added maturity, melody crafted out of dissonance instead of noise created and postured for its own sake, a method and structure Blackshaw’s visited before. 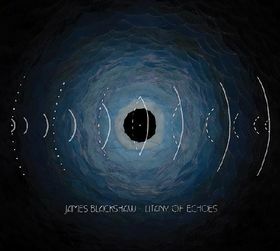 It may take a few albums’ worth of fine-tuning before Blackshaw realizes his masterwork, but at least Litany of Echoes demonstrates that he’s on the right path.